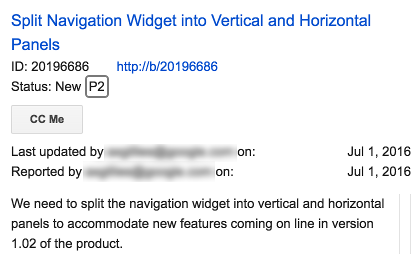 A hovercard in Google Issue Tracker allows you to view summary information for an item without leaving the page you are currently viewing. Issues, components, hotlists and bookmark groups have hovercards. Issue ID found in the Blocked By, Blocking, or Duplicates tab of the Related Issues tray. Issue ID in the Blocked By, Blocking, or Duplicate Of column of an issue search results page. Link to an issue found in the Recent Issues panel, located on the right of a Create Issue page. Status field on a issue page that is marked as duplicate. Link to the canonical issue found in the yellow bar at the top of a page that is marked as duplicate. 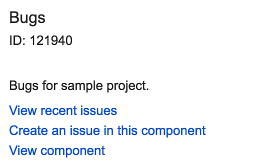 A component within the component hierarchy, as listed below the issue title on an issue details page. Components in the Component Hierarchy or Child Components section of the Basic Information tab of a component details page. Components listed in the Custom Fields tab of a component details page. Name of the hotlist or bookmark group when performing a search for a hotlist or bookmark group. Blue hotlist box found next to the issue title on an issue page. Blue hotlist box found next to the issue title on a search results page if the Title column has Show Hotlists toggled to On. The name of a hotlist that appears in the Selected Items or Add By Query fields of a Bookmark Group settings page.